This ebook is a gift from MyEvent.com and has a value of $29.95. Over the last 12 years, MyEvent.com has hosted thousands of Fundraising Websites. During that time we have helped our clients raise money for themselves, a loved one or for a particular cause or organization whether the event was a dinner for ten, or a walkathon for two thousand participants. We have learned about the triumphs and disappointments from all kinds of fundraising experiences, and can provide you with the secrets necessary to plan a successful, fundraising event while reducing your stress at the same time. In this book, we provide you with the tools, knowledge, and many fundraising ideas to help you with all that is involved in the planning and organizing of a fundraising event. The book will inform you on how to raise more money for your cause by fundraising online. We hope that you are able to derive a lot of information from this book and that it will help you reach your fundraising goal. Planning a fundraiser can be a challenging task, but the helpful guidelines in this book should make the process much easier for you. We will address all of the elements that are critical to having a successful fundraiser from beginning to end, including where to start planning, how to build a donation website, how to fundraise online, and how to raise more money online. Whether you are only considering having a fundraising event or if your planning is well under way, you can benefit from the information and fundraising ideas in this book. In either case you will find great tips to obtain more support through online fundraising and make your event a big success. In the following chapters, we provide critical information needed to keep you on track and on budget, so that you can have the most successful fundraising event possible. Planning a fundraiser in the 21st century has been made much simpler thanks to the Internet. The web has made it much easier to collect information, conduct research and enhance communication amongst participants, donors and sponsors before and after events. The best way to update and inform invitees and participants is through a fundraising website that acts as an e-commerce and communication center. With this website you can disseminate important fundraising details, collect information, make donations, sell tickets, create a buzz and so much more. Being able collect payments and donations online is also a major benefit. With this fundraising website you can disseminate important fundraising details, collect information, share the event with your network using social media, collect donations, sell tickets, have others raise money on behalf of your cause with personal/team fundraising pages, create a buzz and so much more. In the past, creating a website required a lot of technical skills and knowledge that the average person did not have. Thanks to "do it yourself" event website builders such as Myevent.com, the task of creating an event website incorporating online fundraising capabilities such as online donations and personal fundraising pages is extremely easy. This book is intended to teach you how to get the most out of online fundraising even if you have little or no experience. If you only a few weeks to plan, it will limit the type of fundraising event you can have as it will be harder to secure a location, caterer, sponsors and prizes. Regardless of the time you may have, you can still organize a very successful fundraiser that will achieve your mission of building awareness, generating funds or providing new equipment to those who need it. How much you have to spend "up front" on the event will dictate the type of fundraising event you can plan. Online fundraising will save you money as it eliminates postage and printing expenses. Costs and time required need to be considered and funds need to be carefully allocated. TIP: In chapter 12 we list 50 different fundraising events you can have. Be sure to read that chapter and select the on that is right for you. a) What type of event will you hold? Your target audience needs to be kept in mind when making a decision regarding which type of fundraising event you want to have. It will need to engage the audience you are trying to attract so that they will be more inclined to participate, attend, sponsor, donate and spread the word about the event. You need to think of your network and consider what type of event they would enjoy taking part in. For example, holding a golf fundraiser has become quite popular as it is a great way for people to spend the day with close friends while raising money for a good cause. Although tournaments have the capability to raise a lot of money, if your target audience does not enjoy golf, it is not the right choice for your event. Your budget does play a huge role in determining the type of event you can have because certain events require money up front for deposits. The size of your budget may be determined by how many sponsors you are able to secure. The key is to try and get as much stuff donated as possible and get as many sponsors as you can. b) When and where will you hold the event? When to have your fundraising event must also be considered. If your event is to be held outdoors, such as a walk, run or bike, then the event should be held between June and August as it will be the most comfortable weather for the participants. Ski-a-thons and skate-a-thons will need to be held in between December-February to ensure the best conditions. Weather dependant events are always risky, and you should always have a back-up plan and be able to do something indoors. TIP - It is important to secure the registration fees ahead of time and not on the day of the event. The reason is that if the event has to be cancelled due to bad weather you will still have the revenue to pay for everything. If you are counting on collecting money only on the day of the event and the weather is bad you may end up with a very low turn-out and no money to pay for all your expenses. It is also important to mention that tickets will not be refunded in case of bad weather. Most people understand that and are mostly participating because they want to support the cause. You should always make sure that there is parking available close to the location for all of your guests, or offer a valet service. The venue should also be large enough for everyone to be seated comfortably and have enough room for walking and dancing (if you have music and dancing). When organizing a walkathon, race or treasure hunt, for example, the decision of where it will take place needs significant consideration as details and routes will need to be carefully established, permits obtained and security hired, well in advance. c) Who can you get to sponsor your event? Your budget and how much money you raise will be largely etermined by how many sponsors you get. You need a lot of time to be able to do this properly. The first place to look for sponsors is by reaching out to those who have a stake in your cause. Businesses or families that have an attachment to your cause are often willing to help raise money by being a sponsor. In addition to the people who have an interest in your cause you should try and get specific services sponsored by businesses associated with that service. For example, you can approach a restaurant to supply the food for the event. This will cost the restaurant less money because their costs are lower and they will get the added benefit of gaining exposure. These are just a few examples. You can have different levels of sponsorship as well. For example many events have one large sponsor that gives you the most money and they get mentioned on everything (signage, tickets, website etc...).You can reach more potential sponsors by featuring and promoting different sponsorship opportunities on your fundraising website and allow sponsors to purchase sponsorship packages online in exchange for exposure at your event and on your fundraising website. An ad book is a great way to raise a lot of money to help pay for many expenses of the event and raise extra funds. You can have many different size ads (full page, half page, quarter page and business card). An ad book can take a lot of time to plan and execute properly so you need time to reach out to potential sponsors, organize the artwork, find a printer etc. Another option is to offer sponsors an online Ad Book. This reduces the costs a lot because you don"t need a printer! You simply create a page or different areas on your event website where you will promote your sponsors. You can link to their website and large sponsors can have more information about their business. In some ways this is even better than an ad book that you print and distribute because it is less expensive to produce so the charity gets more money and you can give the sponsor even more publicity. You can even collect the money for the ads and the artwork through your MyEvent.com fundraising event website. You can ask anyone to sponsor you! Potential sponsors are everywhere and do not necessarily need to be related to the event. The best way to start is by asking your family, friends, colleagues and other members of your network. Committee members should do the same. By encouraging your network to spread the word to theirs, you will have the potential to reach a wide array of potential sponsors. If you are organizing a golf tournament, you can contact your local golf store, pro shops, and golf courses to see if they want to be involved. You can also visit your favorite stores and restaurants and ask if they would sponsor your events. d) Are you going to need prizes and have giveaways? Most fundraising events have prizes for raffle winners or a trophy for the champion(s) of a race, golf tournament or talent show. Mentioning and featuring prizes that can be won on your fundraising website is a great way to build excitement amongst guests and participants. Prizes should be creative and related to the event, therefore you need to start planning early as getting the goods and customizing them can take time. In order to reduce expenses, you can try and get the prizes and giveaways donated. For a golf tournament, you can ask the golf pro shop for free or discounted goods such as golf bag, balls, golf attire, etc. Giving out loot bags is common at fundraising events. They can be filled with donated goods such as pens with sponsor"s names, restaurant vouchers, a gift certificate for a free golf lesson, or apparel with the organization or sponsors logo. The more “cool” stuff you can get for your loot bag the better. Once again the key is to try and get stuff donated. Sometimes it can be one item that is very much in demand that year or several smaller items that all have some value. Tip: Having a great loot bag is one of the secrets to having an event that everyone wants to attend year after year. e) Is there going to be food? Regardless of the type of event you choose, you should always have something to eat and drink to offer your guests. It doesn"t necessarily have to be a full meal, but snacks and water bottles should always be available. Sponsors can donate snacks and drinks for the event with their name and logo on it. If you are organizing a walk-a-thon or a golf tournament, which usually begins early, a small buffet breakfast can be included in the registration fee. Some venues have restaurants that can supply food for free or at a discount or you can go to local restaurants and ask them to cater the event. f) Will you need volunteers? With any event you choose, you will always need help whether it"s with setting up, checking in registrants and guests, serving food, or directing people to the right area. The easiest way to get people to volunteer is to just ask them for their help. You can start off by simply asking friends, colleagues and family members who will be happy to help, or you can reach out to others who want to help your cause. g) Who is the beneficiary? Having a slideshow or video can personalize the event by sharing stories of why you are holding this event, and about the organization being supported. You can demonstrate why the money is needed and where donations from previous fundraisers went. You can also have information about the beneficiary and how the money raised will help the cause on your website and in print at the event. Many fundraising events have hosts. It can be you, another participant, or anyone from the organization. The host welcomes participants or guests, takes them through the event schedule, thanks sponsors and attendee, and makes closing remarks. Hosts will need time to learn about the cause being supported. Having a guest of honor or a guest speaker at your event is a great way to build excitement and sell more tickets as people are drawn to events where they are eager to meet and hear from a person of interest. Arranging to have them at your event can take time due to scheduling conflicts, therefore the guest of honor or guest speaker needs to be determined early in the planning process. The honored guest or speaker could be a member or client of the organization you are raising money for, who can let the attendees know how much their contributions help. Other possible speakers for your event include community leaders, well known business people, elected officials, etc. If you can manage to get a celebrity at your event this can add a lot of excitement to the event and get your event more publicity. The best way to get a celebrity is to find one that has an attachment to the cause. For example if you are having an event to benefit Leukemia and it is well known that a particular athlete or Television host has a child that suffers from that disease, they may have a special interest in helping your event be successful. The ambience of your event always requires advanced planning. The theme of the event, dress code and booking of entertainment needs to be thought of early on so it can be incorporated into the invitations, selection of venue, and shape the overall type of event you want to have. A fundraising event requires a lot of planning and organizing. In order to facilitate the process, you can develop a committee where tasks and responsibilities can be delegated. The size of committee you should have is dependent on the amount of planning necessary for the event you choose. The committee usually consists of 5-10 members. You can ask close friends or family members or other contacts to take part. They can help share all the tasks that go into planning the event you have chosen. Tasks can include getting sponsors, choosing a venue, selecting a caterer, managing the website, setting up the day of the event, inviting guests, selling tickets, getting sponsors, coordinating loot bags, managing an ad book, prizes, PR, and fundraising. Committee members should ideally be as diverse as possible and from different social circles. One of the most important roles of the committee is to get sponsors in one way or another, and create a lot of interest so there is a lot of participation in your event. You want to recruit those who have a large personal network and the ability to sell tickets and fundraise. Each committee member may have a particular task such as food, or venue but everyone should use their social networks to try and get sponsors and donations. You must keep your committee motivated by providing them with regular progress updates, offer support and guidance, and reminding each member of their goal. 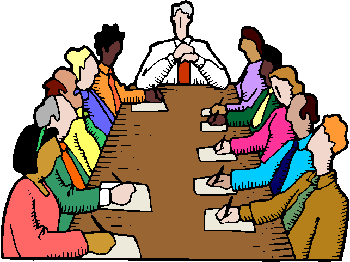 Each committee member should have one or more specific responsibilities. One committee member should be in charge of invitations another can be in charge of catering, and another in charge of the website. If certain individuals have specific talents, be sure to put them in charge appropriate tasks. As an example an accountant should be in charge of the finances, someone with connections to a printer can be in charge of the ad book and so on... Time management is crucial to success. You need to write down dates in a calendar, send out reminders and ensure that everyone is meeting their deadlines. Planning a fundraising event, such as a gala, race, golf tournament or talent show, is one of the best ways to raise money for a particular cause or organization. Regardless if you are running your own event or part of the planning committee of an organization, using a fundraising website to plan an event and raise money online will save you time, reduce stress and increase the revenue raised. Having a website dedicated solely to your fundraising event will provide everyone with a go-to place to turn to with all the information pertaining to the event. 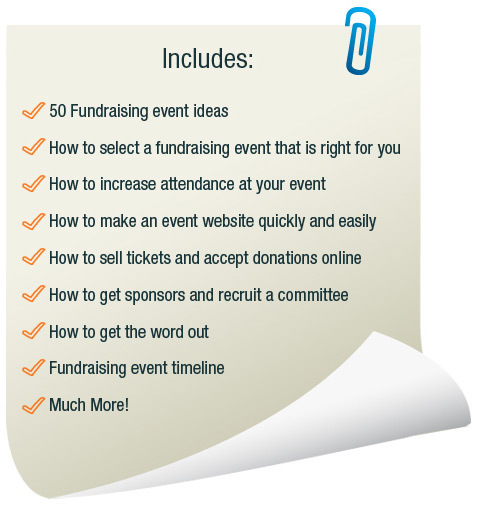 If you are planning an event alone, or if you are working with an organization that does not have a fundraising website, you can quickly and easily create one on fundraising.myevent.com. There is a 7-day free trial available and our fundraising website builder is specifically designed for people who have no technical skills. MyEvent.com has extremely helpful customer support that is available to help you 7 days a week. MyEvent.com can provide you with all the necessary fundraising, planning and e-commerce tools to guarantee you have a successful fundraising event. Best of all, it is extremely affordable. MyEvent.com has packages to fit your every need from a free simple donation webpage that includes registration, selling tickets and accepting donations to a full website with personal and team fundraising pages and an online auction! Creating a website for your fundraising event can be a task delegated to one of your committee members. MyEvent.com makes it so easy to build and so simple to use. All of the planning, fundraising and e-commerce features are built directly into the website allowing participants and guests to easily register and RSVP, and for you to effortlessly collect registration fees, donations, and tickets payments all online. Website viewers should be encouraged to sign up for newsletters as this is an effective way to build your list of supporters to incorporate into your fundraising tactics. 1. Create a Communications Hub: Your fundraising website will be the place to collect and disseminate information, and it will make you and your event seem professional. The website will save you a lot of time and reduce your stress eliminating constant phone calls and sending information back and forth as everything can be done quickly online. 2. Easily Sell Tickets and Raise Money Online: Online fundraising makes it easier for organizers, donors and sponsors. Having an online donation form on the website, allows donors to contribute using their credit card. People have come to expect this. No one likes having to write a cheque and mail it in, and it is more convenient for donors and fundraisers. Participants can even have their own personal fundraising page on MyEvent.com where they can raise money online on behalf of your cause. 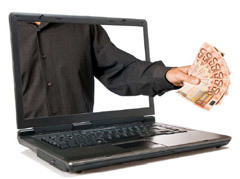 Best of all, you don"t need a merchant account or a PayPal acount with MyEvent.com. Ecommerce is built right into your website. 3. Increase Attendance: By looking professional, and creating a buzz about the event you will increase your reach, get free publicity and increase the interest in your event. Making it easy for people to register and pay online will also raise the number of participants and guests who come to your event. Offering potential guests the ability to purchase tickets online with a credit card is a great way to increase attendance and reduce your workload. It also makes it easier on your guests. In order to ensure that the largest number of people can attend your event, you can create an online poll on your fundraising event website to determine the best possible date to hold the event, or survey your guests on a myriad of questions. This is also very helpful after the event to get suggestions for next year. Having a fundraising page allows you to promote your cause amongst your network and collect donations directly on the website. Each page has a thermometer to display how close you are to reaching your goal. You can choose from thousands of pre-designed templates or have one of MyEvent.com"s designers create a custom website design just for your fundraising event. The RSVP page is a good way to know who intends to come to the event. This can give you important planning information, and give you a list to follow up with. A Who"s coming page can be activated to inform others who will be attending the event. It is easy to send out invites to all potential guests and participants using broadcast emails. You can also send reminders and thank you letters. Doing it all online makes it easy to ensure that your guest list is always up to date. Organize the entire auction online. Donors supply products or services for your guests to bid on directly from your event website. An online auction can be much more successful than a silent auction because it can occur before and after the event. An excellent way to raise money for the event is to receive sponsorships. You can have a Sponsor"s Page on your website which will mention their contribution and provide them with added exposure. Sponsors can also pay for ads through the website and upload their artwork. A picture is worth 1000 words. Videos and photos can be easily uploaded and are a great way to personalize your event website. Creating photo albums is a great way to create memories from the event. This allows you to monitor and keep track of your expenses and calculate the cost-per-ticket for your fundraising event. You can enter information such as when you need to book certain vendors and share information with the committee to keep everyone on track. Give everyone a chance to leave a comment and suggestion before and after the fundraising event. Promoting your event on Facebook and Twitter will drive more visits to your website and sell more tickets. Build any type of form to collect information from your guests or donors or sponsors. There are several important reasons why to have a MyEvent.com fundraising event website. 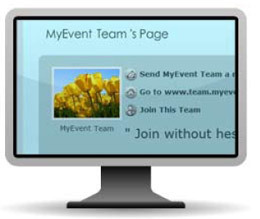 MyEvent.com websites have built in features to raise money online for any type of fundraising event you choose. You can make a simple webpage with integrated donations and ticket selling tools to raise money online for a loved one, or a more powerful site that comes with personal and team fundraising pages for a big fundraising event. 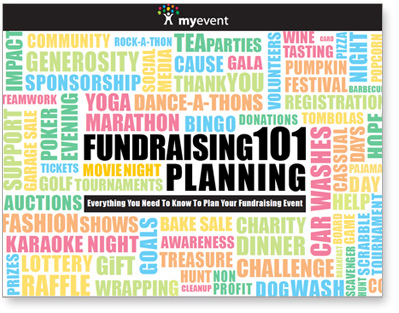 MyEvent.com provides you with all the tools you need to plan your event and raise as much money as possible by promoting your event using social media capabilities. With different package offered, including a free hosting option, MyEvent.com makes it affordable, fast, easy and seamless to accept payments for ticket sales and donations online at the lowest rate. MyEvent.com has PCI, TrustE, and the Better Business Bureau certifications to ensure security and privacy. MyEvent.com has toll free customer support 7 days a week as well as live chat, email support, and a great help center. Regardless of how big or small your event may be, with an 11 year track record, MyEvent.com knows how to provide you with all the tools to guarantee a successful fundraising event. If you have not already done so, you should take the time to explore all of the features on the main fundraising website at www.fundraising.myevent.com. Click on FEATURES to see all the things you can do with your event website, click on PRICING to select a package that fits your needs, and click on TESTIMONIALS to see some great examples of websites that have been built on MyEvent.com. You can get some great ideas from what others have done which you can use for your own fundraising event website. In order to participate in any fundraising event, participants need to register, and usually pay a registration fee. The registration form should be short and sweet and only ask for mandatory information, including; first name, last name, e-mail address. From event to event different information is relevant and required. Using MyEvent.com you can customize your registration form according to the specifics of your event. MyEvent.com offers all kinds of customized registration tools including a free and paid registration option. With MyEvent.com fundraising websites, participants can register and pay the registration fee online, making it simpler for both planners and participants. The fee to participate will range from one event to another and will usually depend on if there will be food, entertainment and prizes at the event. If you decide to hold a free event, you can still have guests register for your event using the tickets feature and setting up a $0 ticket. You will save money on postage and avoid paperwork because all the reports are ready for you in your control panel. TIP: You can offer participants an early bird registration price with a clearly stated cut off date. Reminders of early bird specials can be featured on the website calendar and sent out using the broadcast email tool. The registration fee can also be made non refundable, however this may deter participants from registering early. A link to your registration form should be accessible from multiple areas, including the website, e-mails, and social media outlets. You need to make sure that the registration process is simple, fast and easy. It is important that each step is a positive experience so that participants are happy to be a part of the event and are more likely to share and encourage others to take part. Your fundraising event website is the destination where viewers can go and obtain all information, updates and register online to participate. You can create interest in the event by including photos and videos of past events. Creating a buzz will increase your attendance. You can customize registration forms according to your event and pay the registration fee directly on the fundraising website. By making registration and payment simple you increase the odds that people will want to participate in your event year after year. You can send out reminders easily using broadcast emails. Communicating with your guests consistently will insure that they don"t forget about your event and participate. The social media tools built into your website make it easy for people to share your event with all of the participant"s social networks and this broadens the reach of your event. Sending out a fun and informative "save the date" is a great way to create a buzz about your fundraising event. The main purpose is to let people know about your event and why they should attend or participate. It is a call to action as you are asking people to add the event to their calendars. It should be colorful and attention grabbing, however not too long. It is so easy to do using your MyEvent.com website as it can easily be sent out online using the broadcast email tool. Sending out a "save the date" is effective for any event, however more important for larger fundraisers such as galas or walks. 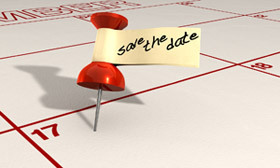 The "save the date" should include the type of event, date and location. Making people aware of the event way in advance is a way to maximize RSVPs. The "save the date" can encourage people to visit the website and inform details about how to register online. You can even include a short personal note letting people know about the cause you are fundraising for, why you are involved and why they should help. Regardless of the type of event you will be holding, you will need to send out invites. Invites can now be sent out online using the broadcast email tool available on MyEvent.com fundraising websites. This eliminates the hassle, costs and effort of printing and postage. Even if you feel the need to send out a paper invitation by snail mail you should definitely encourage people to RSVP online. Invitations should be sent about 3 months before the event. Depending on your event, invitations should re-iterate the key information such as time, date, location, food, entertainment, guest of honor or guest speaker and prizes. Instructions on how to register, purchase tickets, and donate online should also be provided. You want to encourage people to purchase their tickets quickly and you should therefore offer them incentives to do so. You can offer early bird specials and quantity discounts. TIP: Incorporating a contest, such as "buy your tickets before October 31st and you will be entered into a draw to win your tickets and a free dinner" will push people to purchase earlier. You can mention that they will receive 100% refund if they cannot attend, therefore there is no reason not to purchase tickets today. Stating that tickets can be purchased online from the website using their credit card will increase purchases as it is much more convenient then having to write a check and mail it in. People have come to expect this from all fundraising events. The nice thing about sending online invitations is you can send them more than once as a reminder if you have not received a response. Follow-ups are very necessary and serve as a reminder. Two weeks following the initial invitation email, a second invitation to non responders can be sent, however you should change the subject line, look of invitation and include cut off dates of early bird pricing. A third invitation can be sent out about a month after that, and the subject line should once again be changed. A forth invitation can be sent out about a month prior to the event and should include a personal note to persuade people to sign up. It should also indicate that time and spots are limited and only a few days left to be able to participate and make a difference. A final invitation can be sent 2 weeks before the event simply reminding people o f the date of the event and that this is the last chance to register. 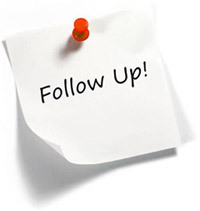 You need to follow up and send reminders to potential guests and participants. Sending out regular broadcast emails that includes tips on how to raise more money online and set up personal fundraising pages and information such as prizes, honored guests or celebrities that will be in attendance gives people more reasons to attend. You also need to encourage people to go and visit the website, register for the event, and spread the word. Print and radio ads are a way to promote your event, however, using social media has become the most cost effective and popular way to spread the word. You can tweet about the fundraiser to your Twitter followers, or send a broadcast message to your Facebook friends in an instant all directly from your fundraising event website. If at all possible get a celebrity to tweet about your event. You can create a Facebook event page and share the link on your event website. You can also consider forming a Twitter list which is an easy way for people to connect before and after the event. MyEvent.com allows you to reach out to your social networks from within your fundraising website with a simple click of your mouse. Sharing your personal or team donation page link with your network is an efficient way to reach a lot of people and receive online donations Using Facebook, Twitter, and LinkedIn is one way to create a buzz about your fundraising event. 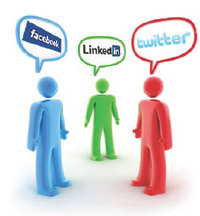 You should encourage your guests to promote your fundraising event to their social networks. With the increasing popularity of social networking, you won"t believe how far news of your event can go. This is a way to get people to keep coming back to the website. You can include how many people have registered, names of most recent registered participants, names of most recent contributors and other news about your event. You can also create a page to highlight the top fundraiser of the week. It can be an opportunity for others to learn information about other participants, teams and personal stories of why they are involved and raising money. The website can also feature a fundraising "tip of the week" to encourage daily website visits. For events such as races and treasure hunts, you can post occasional clues on the website, so that viewers can get ahead of their competition. Make mention of all the great prizes that you can win or a special guest that will be attending the event. Show pictures and videos of previous events if they were successful. Using MyEvent.com you can have a "Tickets" page built into your fundraising event website, or you create a fundraising webpage simply for the purpose of selling tickets online. When you set the ticket price for your event you need to consider the type of event you are having and your fundraising goal. Events such as galas will charge more due to costs of catering, entertainment, renting large venues, etc. Your ticket price should be established based on your expenses and how many tickets you expect you will be able to sell. • Selling tickets online directly from your event website: it is very convenient for your guests to be able to purchase ticket(s) online with their credit card, and it is much less work for you. • Easy ticket set up: simply enter a title, description and price for your tickets. No merchant account or PayPal account required. • Safe and secure transactions: follows strictest industry standards to ensure safety and security for all clients. • Track transactions and payments in real-time: monitor all ticket sales and donations as soon as they come in. • Best Rates: very affordable rates. Offer lowest credit card transaction and processing fees. • Guests remain on your website: name and contribution of donors can stay on website throughout the purchase process. • Choose how you want to get paid: you choose frequency and desired method of payment (direct deposit, check or wire transfer). • Toll Free Help: MyEvent.com has Toll Free Customer Support, 7 Days a Week. Regardless of the type of fundraising event you choose to have, the primary purpose is to raise awareness and money to support the cause. Every event, from a marathon, to a dinner, involves soliciting friends, family, colleagues and other people from your network in order to raise the largest amount of money possible for your cause. No matter if your event has 1000 participants or if you are doing the event alone, you have a goal you are striving to achieve. Being able to accept donations online makes it easier to attain and surpass your goal. MyEvent.com can provide you with all the tools you need to facilitate all of your online fundraising needs. 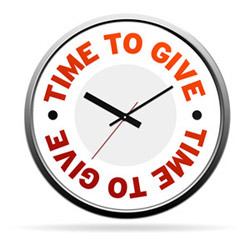 Using a MyEvent.com website to raise money for your fundraising event makes giving and receiving donations fast and easy. The best part is that it can all be done online by creating a simple donation webpage to share your story and collect money online or by building full fundraising website with integrated fundraising tools and pages. There are several advantages to raising funds online. It allows you to achieve your goal faster because it is more convenient and easier for donors to donate online using their credit card. From one central location, donors can learn about and support your cause. You can easily collect payments and you can choose when and how you want to get paid. You don"t have to worry about safety and security as MyEvent.com takes care of all privacy and safety concerns. You can promote your fundraising campaign online by including a link to your website on social networking sites which leads viewers directly to the donation page on your website. By emphasizing how easy it is to donate online, you can raise more funds including from people who could not attend the event. You can track all incoming fundraising donations in real time so you are always aware of how close you are to achieving your goal. Each fundraising page has a dynamic graphic thermometer to demonstrate this as well. Donors names and contributions can remain on the site for the duration of the event and they can post regards and words of encouragement. In addition to having a general donations page on your website, participants in your event can also fundraise by getting their own personal fundraising page that they will share with their network. Whether you are raising money for yourself, a loved one, cause, or charity, this type of personal fundraising has become very popular and successful and now you can do it easily through MyEvent.com. Traditionally the kinds of events that lend themselves to this kind of personal fundraising by participants are physical sporting events like walks, runs, bowl a thons, etc...You wouldn"t think of asking people who are attending a gala to fundraise for your event, however you could ask people on the committee of any event to get a page and reach out to their networks. You might be surprised how much more money you will raise with this strategy. MyEvent.com offers both a personal fundraising page and a team fundraising page. Individuals with personal fundraising pages can fundraise alone, start a team or join a team. Team fundraising is fun and creates a competitive environment. Once a participant is registered, they will receive access to their own personal fundraising webpage and be searchable on the team fundraising page if they are on a team. A team fundraising page can be set up in seconds. All that is required is for one person to start a team, the captain, and then others will be able to join. Once the fundraising pages have been created, participants can begin to promote their involvement with the cause amongst their network of family, friends and co-workers. Those who have been asked to donate will be brought directly to the participant or team page where they can donate online and browse the rest of the website. Both personal and team fundraising pages can incorporate text, photos and videos, thermometer displaying goals, and donor names and comments. A personal fundraising page allows the participant to explain their attachment to the cause whether it be through sharing stories, pictures or videos. The participant can personalize their page and explain why they are participating, and why they want to raise money for that particular cause. When fundraising in teams, each team will get their own page that lists the individuals that are fundraising for that team with links to their personal fundraising page. Many fundraising events have proven that team fundraising increases donations due to the friendly competition that develops especially since each website has a leader board. Participants have more fun and more money is raised for the cause when fundraising in teams. Regardless if fundraising alone or in teams, fundraising pages should be personalized and should reveal that you are passionate about what you are doing. Encourage participants to include as much information as possible including who the beneficiary of the fundraiser is and what their connection is to the charity. People want to support you because of how much you care about the cause, therefore your dedication must be clearly communicated through your fundraising page. TIP: Want to start fundraising online as quickly and easily as possible? Using the MyEvent.com basic free hosting package, you can create a well designed webpage in minutes that will act as your personal or team fundraising page where you can begin collecting donations and receiving tickets payments immediately. The webpage is free to build, has no application process and no merchant or PayPal account is required. Potential sponsors are everywhere. You can ask anyone to be a sponsor. Obtaining sponsorships is an excellent way to save money and cut administrative costs. Sponsors do not have to relate to the cause or event you are planning, but your chances are much higher of getting a sponsor that has an interest in your cause. For example you may get a venue to donate its premises if the owner has a relative inflicted with the disease you are raising money for. You should reach out to potential sponsors at least 6 months prior to the event if possible. In order to get a sponsor to say yes to you over other people or organizations, you need to be creative and stand out. Your first contact with potential sponsors should involve a personal approach and demonstrate why you are supporting the cause and how their contribution can help. If you cannot get a sponsor that is attached to the event because they have a common interest in raising money for your charity, you may find one that can benefit from the exposure. A new restaurant may be interested to donate the food for one of the meals at the event in exchange for exposure through your website, and marketing materials. With your fundraising website, it is so easy to become a sponsor by signing up and paying right on the website. A sponsor"s page can also feature the sponsors and have links to their website allowing them to gain more exposure. Having a particular sponsor support your cause can draw people to your event. Sponsors are important to the success of your fundraising event because they add value as well as marketing and promotional outlets. TIP: If you can get media sponsors such as a TV or Radio station they can bring a lot of free publicity to your event. Fundraisers and sponsorship opportunities are great business partnerships. For example, if a local restaurant logo will be advertised at your event. The restaurant should also be advertising your event to build awareness and interest amongst their clients. This sort of promotion is helpful because people are more inclined to be part of causes their favorite places are involved in. Sponsors can also provide goods such as snacks and apparel with their logo on it, or supply products for event loot bags. The best way to get sponsors is to reach out to your networks of family, friends and colleagues and encourage others to do the same. If you can get your contacts to spread the word about your event with their networks, it will make the process of building awareness and obtaining sponsorships much easier. If you cannot get sponsors that have an attachment to the cause and you were not able to find sponsors in specific areas who could benefit from the exposure, then you should break up as many activities as you can and offer them up as sponsorship opportunities. Examples of sponsorship opportunities are; meal, bar, golf carts (if it s a golf tournament), signage, music, venue...you get the idea. You can package virtually anything as a sponsorship opportunity and that way you are not just approaching a potential sponsor and saying give me money; you can offer something in return – advertising and exposure. Ad Book. An ad book is a great way to raise money. You can have many different size ads for different prices and offer exposure to your sponsors in exchange for a paid ad. You can also offer exposure on the website in addition to the ad book. If you are on a tight budget you may want to forgo the ad book and only give sponsors visibility on the website and save the costs to print the book (which can be a lot of money). A way to raise even more money at your fundraising event is to have an auction. 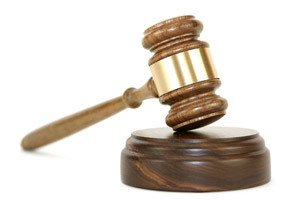 You can choose whether or not you want to run a physical auction or an online auction for your event. MyEvent.com makes it so simple and easy to set up an online auction where people bid on items online. An online auction has proven to be more successful than a silent auction because people are usually too busy socializing during the event and do not always have a chance to see and bid on items. Whether or not you are planning on physically holding an auction at your event, you can use MyEvent.com"s online auction features to exhibit the items. This is a way to get guests to see and learn the descriptions about what is being offered prior to the event. Donors can simply submit products and services for the auction directly through your fundraising website. These people or companies will benefit from the added exposure they will receive. The entire system is automated and you can receive optional email notifications every time a bid is made at your auction. Guests can bid on items prior to the event, and there is also the option to set a "Buy It Now" price. All payments can be made directly from the website using a credit card. Restaurant gift certificates, hotel stays and event tickets are some examples of great auction items. Guests can take time to familiarize themselves with the items being auctioned as they can view them and their descriptions online prior to the event. With the ability to provide a longer time period to make bids, it will increase the overall price you will get for the item. 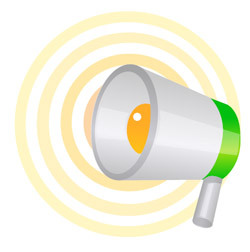 The products and services being offered can be promoted using social media and broadcast emails can be sent out when there are new items up for auction which will encourage people to go check it out. Can pledge items hassle free right through the fundraising website saving time and costs. No longer will you need to follow up or chase people to pay as all items can be paid for online with a credit card directly through your fundraising website. Can offer a "Buy It Now" price for products and services and charge more for items. More publicity and exposure to those who donate items that are featured online for the auction. Raffles are a simple and easy way to raise more money at your event. Your costs are minimal, and the proceeds reflect the number of tickets sold. With a raffle you can achieve high profit margins. If you can get the prizes for your raffle donated, the only costs are the printing of the raffle tickets which can perhaps be donated as well or you can use very inexpensive raffle tickets. Raffles are great for any type of event or any number of participants or guests. You can sell tickets to the raffle online through your website quickly and easily and without a merchant account, and display information and pictures about the prize. Great prizes are essential for the success of your raffle. When deciding on what kind of prizes you should have, you need to consider what your potential supporters will value. Some examples of prizes that attract attention include; new car, free trip or cruise, electronic equipment (TVs, iPods), or gift certificates to local stores and restaurants. How to go about getting these costly prizes is something you need to consider. The best way is to ask members of your network if they have something of value to contribute or if they know of someone who can. Try and get people that sympathize with your cause to donate prizes. 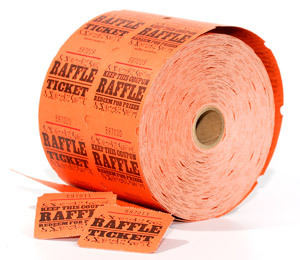 In order to raise funds, the ticket price for your raffle needs to be high enough to reflect the value of the prize but not too high to deter people from purchasing. You need to think about your audience when deciding on ticket prices and think about how much your supporters would be willing to spend on a ticket. The bigger the prize, the more you can charge. If you sell a lot of tickets then you can lower the price of each ticket accordingly. On the other hand people might feel they have a better chance of winning if you do not offer too many tickets. This all has to be considered when planning your raffle. Raffle tickets can be purchased at the event or perhaps can include the option of purchasing raffle tickets, along with your event ticket, online. 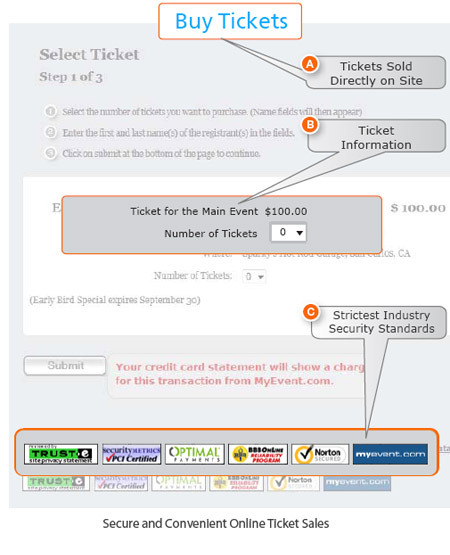 Using MyEvent.com, you can even create a simple and free webpage to just sell raffle tickets online prior to your event. Raffle prizes can be featured on the website which will notify people about the raffle and at the same time build excitement about what they can possibly win.